Blue whales are truly majestic giants of the ocean. The enormous size with their contrasting gentle behavior fascinates and entices one and all. 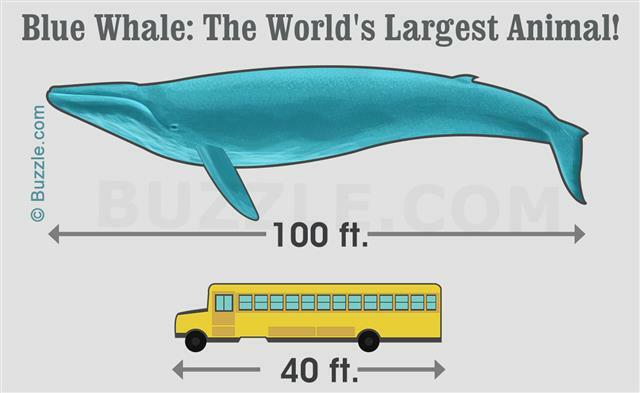 The blue whale is the largest animal known to have ever lived on Earth, even bigger than the largest of the dinosaurs. 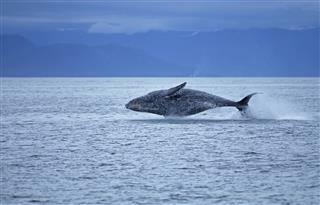 Even the blue whale calves enter the world already ranking among the planet's largest creatures. These massive creatures were abundant in all the oceans until the beginning of the twentieth century, after which they were almost hunted to extinction by whalers. Thanks to conservation measures the species has managed to survive and the population is slowly reviving. 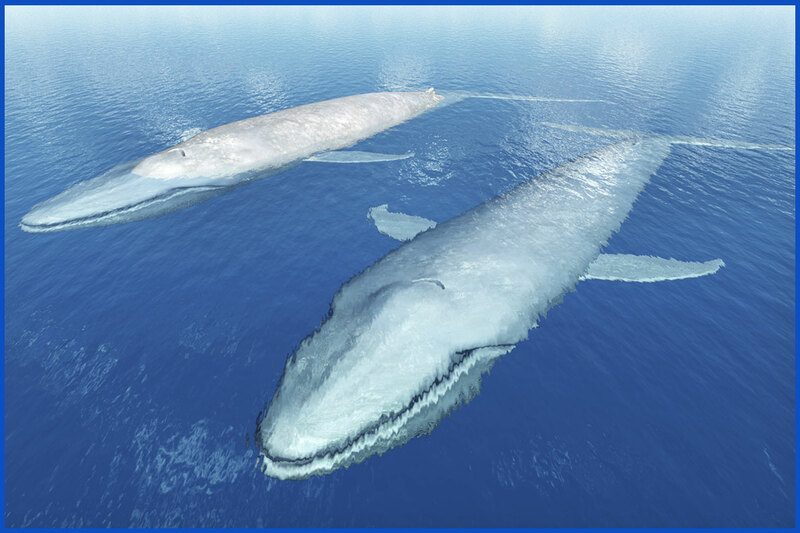 Blue whales are classified as ocean mammals and not as a fish as they are warm-blooded. Blue whales have some amount of hair or fur and feed their progeny with milk. They come under the order Cetacea and their biological name is Balaenoptera musculus. • Blue whales have a long, tapered, streamlined body. They look true blue underwater, but on the surface their coloring is more bluish-gray. • The smooth body is almost free of parasites, though there are some barnacles on the tips of the flippers, dorsal fin and the edge of the fluke. • The flippers are short, tapered and are 3 to 4 meters (9.8 to 13 ft) long, the dorsal fin is curved, small and can be up to 12 inches long. The tail flukes are shaped like a triangle, and are broad. • The head makes up about 25% of the body. The head is U-shaped, flat and broad. The front part of the mouth is thick and has fringed plates of fingernail-like material, called baleen. This is used to filter krill when the whale forces out water from the mouth. • From the lower jaw to the navel, there are around 55-68 ventral grooves or pleats. At any given age, the female is larger than the male. • The length of a full-grown blue whale can go up to 25-30 meters (82-105 feet) and it can weigh up to 180-200 tons (163,293-181,437 kilograms). 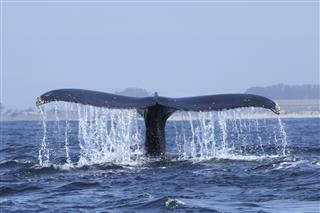 • Blue whales found in the Northern hemisphere are about 75 to 80 feet long. Those in the Southern hemisphere can be about 90 to 100 feet long. • Blue whales can be found in all the world's oceans, while there are several distinct populations of blue whales found in the Atlantic and Pacific. 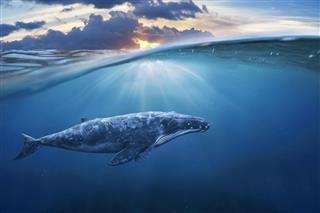 Blue whales are shy creatures and, after the whaling era, sightings have become even more rare. However, they are most likely to be spotted around Iceland and off the West coast of USA, where the population has seen an upward trend. • On the other hand, the number of blue whales in the Antarctic remains extremely low. Blue whales migrate long distances and prefer warm, low-latitude tropical waters in winters and cooler, high-latitude polar waters in the summers. They are often spotted along Adelaide and Melbourne coasts from January to May each year. 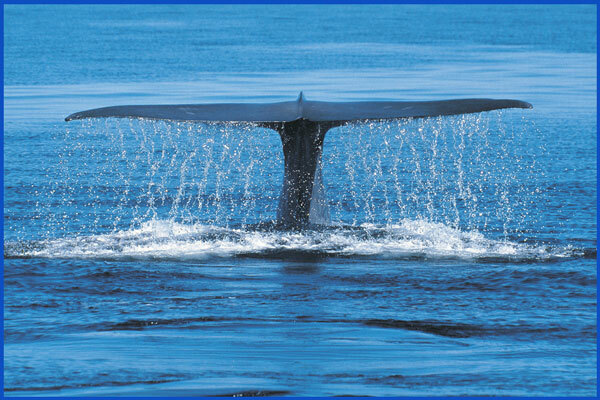 • Blue whales can be spotted alone or in small groups, but most frequently as a pair. 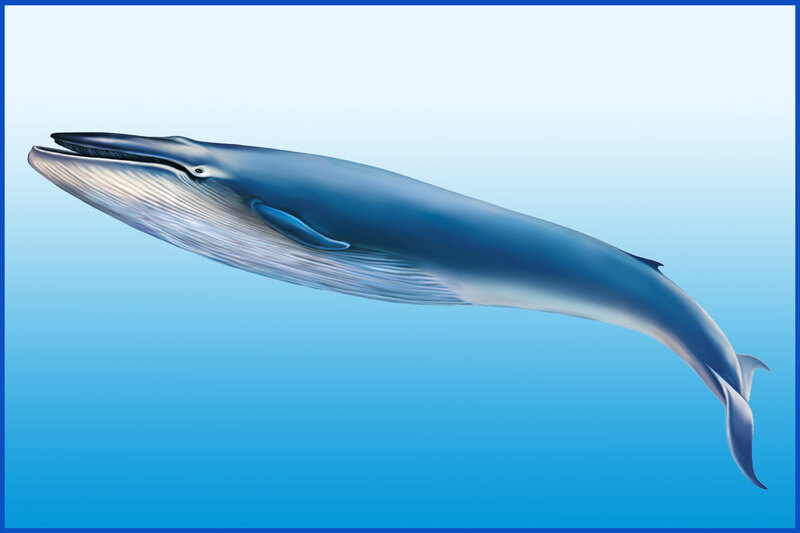 Considering their enormous size, blue whales are quite fast and strong swimmers. Generally, moving at the speed of about 12 mph. However, when they are alarmed, they can accelerate up to 30 mph. • Blue whales are known to migrate great distances toward the equator from the polar regions as winter approaches and are often spotted off the coasts of California and Mexico. 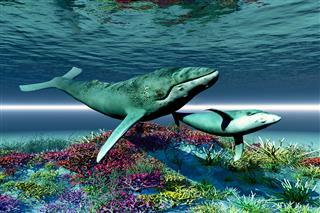 They change their habitat from tropical waters to temperate mainly to reproduce and give birth. They usually spend summers feeding in the polar regions. • Blue whales are among the loudest animals on the planet and are known to vocalize in a singing fashion. They emit a series of pulses, groans, and moans. It is believed that, under ideal conditions, blue whales can communicate over a distance of about 1,000 miles (1,600 kilometers). • Blue whales reach sexual-maturity between the age of six to ten years. At this age, they generally grow to about 74 to 79 feet in length. Very little is known about their mating behavior. • Females give birth every 2 to 3 years, and the gestation period lasts almost a year.• The average lifespan of blue whales in the wild is around 80-90 years. • The average lifespan of blue whales in the wild is around 80-90 years. • Their primary diet consists small, shrimp-like creatures called euphausiids or krill. An adult blue whale can eat up to 40 million krill in a day. • When feeding, blue whales take in enormous quantity of krill-infested water in their mouth. Instead of teeth, they have baleen plates to filter food, which is majorly krill, plankton and small fish. While the mouth is being closed, water is thrown out of the baleen plates. • There are approximately 320 pairs of baleen plates that are 1 meter long, 53 centimeters wide and weighing 90 kg. The food gets locked near the tongue and is swallowed. • Blue whale's tongue can weigh two to three tons and it big enough for fifty people to stand on it. When this creature comes to the surface for air, the water-spout that is released from the blow-hole can reach up to 30 feet. 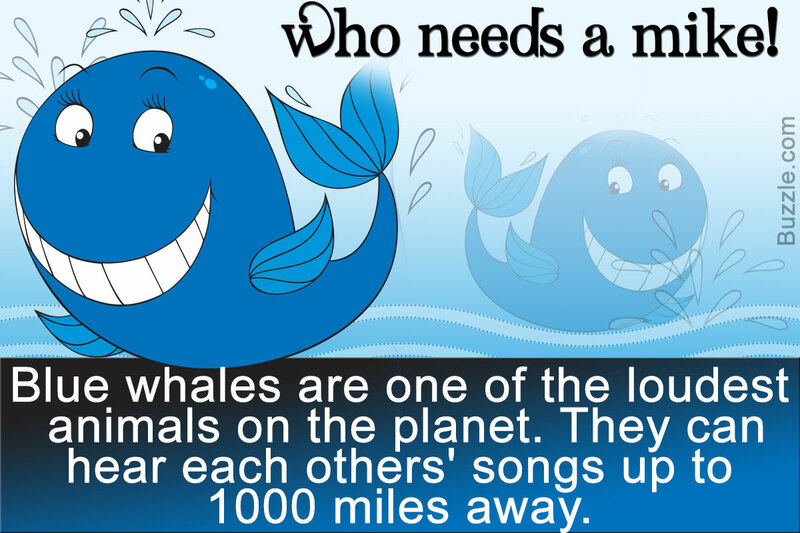 • The sound of a blue whale may reach 188 decibels, making it louder than a jet, which clocks around 140 decibels. • Blue whales are about 1250 times larger than their food (krill), which are on average only 1 or 2 centimeters long. • The main arteries of a blue whale are wide enough for a small human to swim through. Although it feeds at a depth of less than 330 feet, it can dive up to 1640 feet. One dive can last anywhere between 10 to 20 minutes. • While this mammal is as huge as a Boeing 737 aircraft, the blue whale's heart weighs as much as a small car. Blue whales are not harmed by any living species other than humans. 99% of whales were killed due to whaling, pushing the species to the brink of extinction. Many efforts have been taken ever since to revive blue whale population and enable this colossal mammal to prosper and regain its pristine glory. Their population is slowing growing, that doesn't mean the threat is over. Even today whaling is carried out illegally, and many whales are killed as a result of oil spills and impact with large ships. Blue whales are currently classified as endangered on the World Conservation Union (IUCN) Red List.